One of the greatest parts about having a full Academy at The Hasentree Club is the opportunity to help adults who are looking for answers but don’t know where to turn. Mr. Hupp is an extremely hard working student who was struggling with his game. He doesn’t have as much time to play as he used to due to a young family and a pharmaceutical job, but he continues to strive to become better each week. This article will document some of his big changes over the 8 weeks we spent together during the Spring Semester of the Men’s Academy. This first picture highlights the backswing changes from a down the line view. Both swings were captured at full speed! Notice anything different? One ball was a big slice and the other shot was almost a completely straight ball. These types of changes don’t happen overnight. This takes a huge work ethic. Mr. Hupp never stopped practicing (even during the night shift at the pharmacy). Much of this change was due to the difference in the right leg at the top of the swing. This is a topic for an instruction article, but it is important to note here. The right leg straightening in the backswing is an extremely important piece to the puzzle. 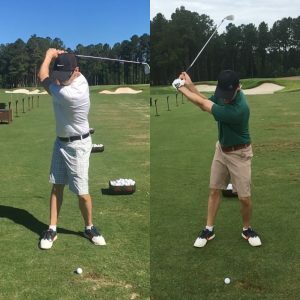 For many years, the straightening of the right leg (for right handed players) in the back swing was discouraged and even ridiculed in golf instruction. For that reason (and almost that reason alone) we now have a generation of people who slice the ball. Here are another set of changes from a Face On viewpoint. Again, there are some major differences. The biggest is the amount that the weight has stayed forward and the shoulders have tilted. All (ALL) great major champions have a certain amount of tilt to their shoulders at the top of their swing. It helps their head stay centered so they are able to strike the ball better. For a right hander, tilting your left shoulder down at the top of the backswing may be just what you need to improve your game! During our time together, Mr. Hupp was able to shoot some of his lowest scores in years. He went from constantly shooting high 80’s to 90’s and lowered his score to shooting low to mid 80’s nearly every time he teed it up! His goal is to break 80 a few times and I have no doubts this will happen sooner rather than later (once the greens are done of course)! If you would like more information on our adult academies, please contact Seth@iGrowGolf.com!